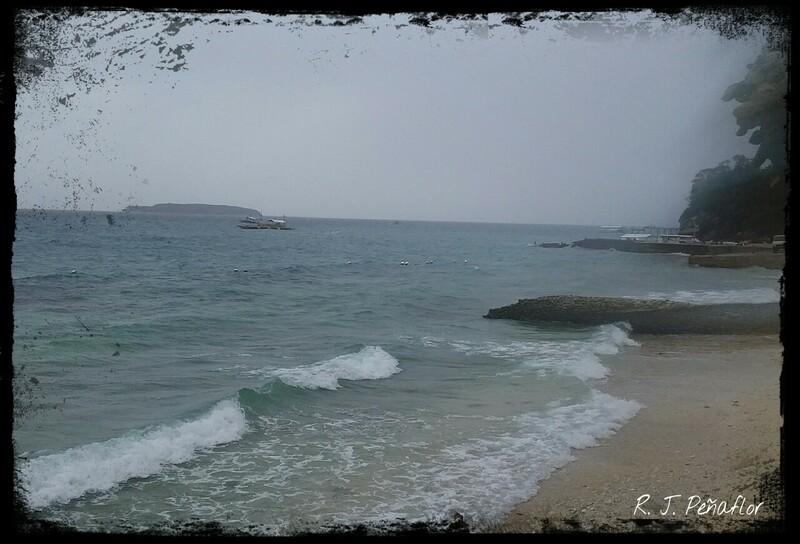 I let the cold drizzle kiss my face as I engulfed the fresh and salty air from the sea. 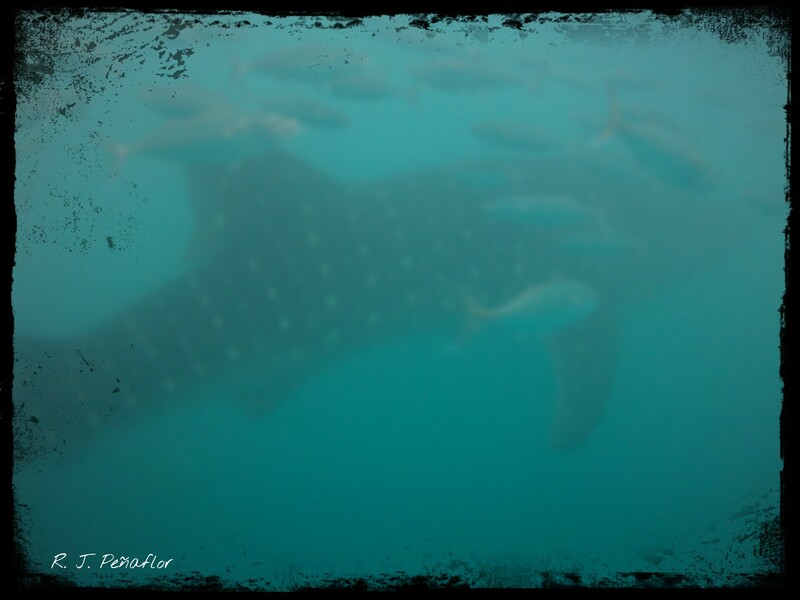 I stared at the boats gathered at the whale watching site in a distance, trying to replay every detail of my close encounter with the whale sharks. The adventure could have ended on these shores but we wanted to see more of Cebu. We had planned to visit a nearby waterfalls but locals have told us this might not be a good time. 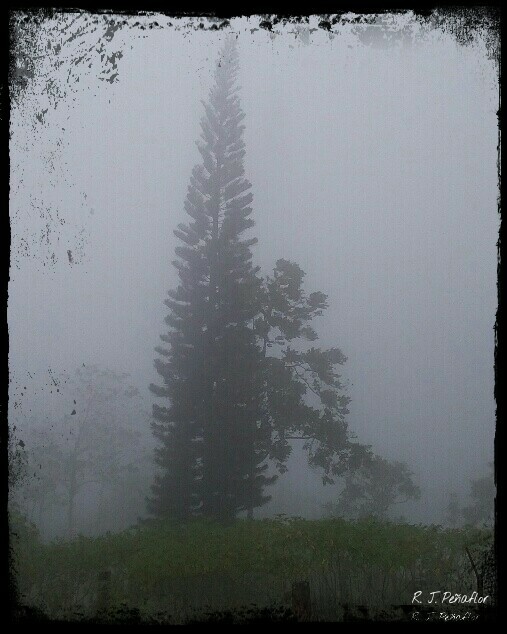 The weather had been very moody, bringing occassional rains that could spoil a trek. 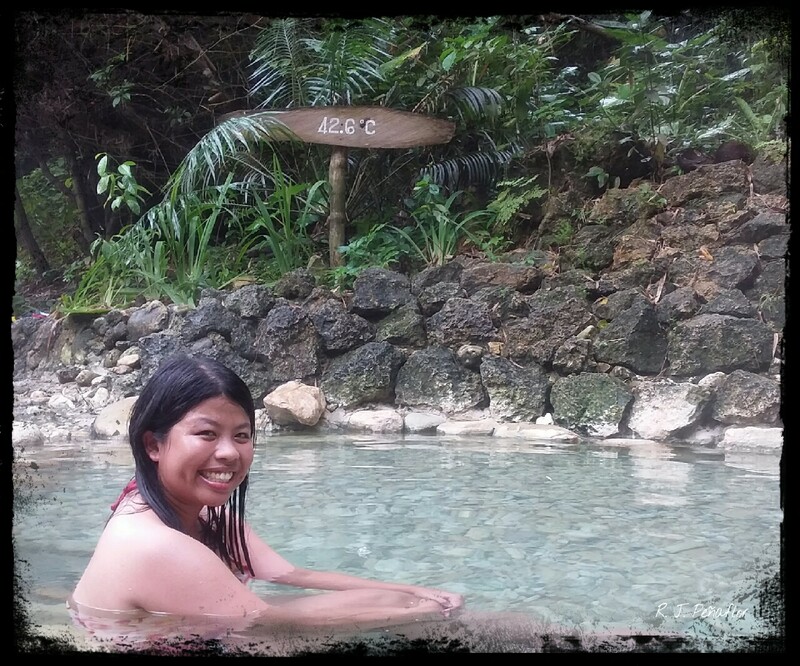 We opted to try the hot springs at Malabuyoc which would take more than an hour’s travel from Oslob. Upon reaching Bato bus terminal, we negotiated with motorcycle riders who had ferried us to the site. I advice you to better rent a car when visiting every tourist spot in Cebu because public transportation can be more costly. Travel time from Bato to Brgy. Montaneza in Malabuyoc would take almost an hour. 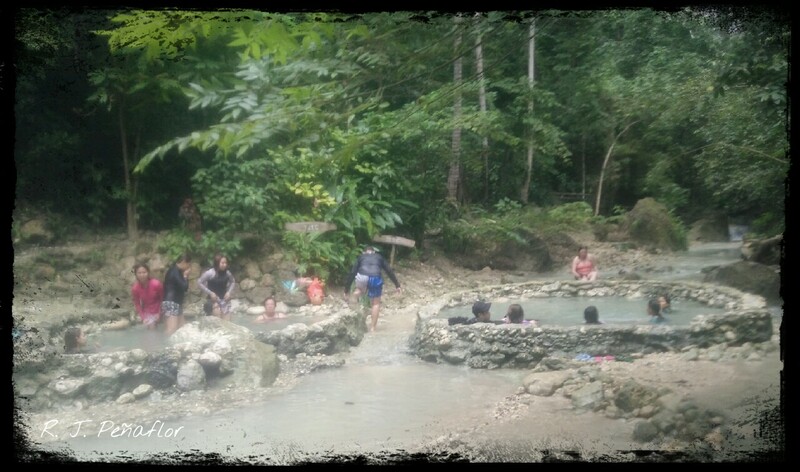 The Mainit Springs (which is derived from the Tagalog word “hot”) is located in a dense forest filled with coconut trees. These sulfur springs are placed near a dormant or extinct volcano (whichever version you might hear). Entrance fee is only at Php20 and the site open from 6 am to 5 pm. The four springs come in varying degrees of heat. The coolest was at 36 degrees while the hottest was at 42 degrees. The coolest spring became even cooler because of the rains. But the ones at 40 and 42 degrees were not as easily bearable as you think. The secret to tolerate really hot pools is to start dipping the toes into the steaming water and try to slowly put the whole body little by little. Now, I dream of having my own sulfuric hot springs at home because it’s good for the body. It could prevent me from having a stuffed nose due to allergic rhinitis every morning and that has been proven at my first visit to Mainit in Bontoc (that’s at the northern tip of the Philippines). And because it’s relaxing, I could have dosed off in the pool if were not for my friends who were chatting with me. 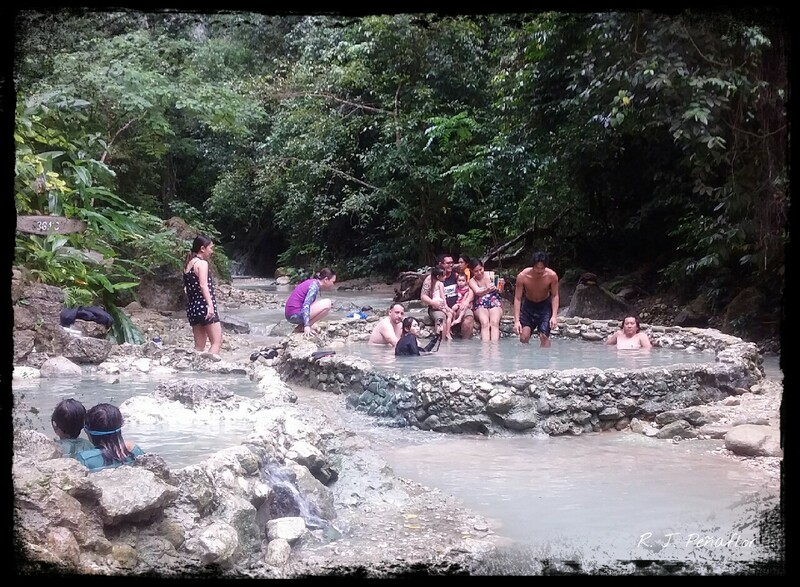 Hot springs can increase metabolism. Saying so, I noticed my heart beat became faster after I dipped in the hottest pool. It’s advisable to immerse in immensely hot pools for a maximum of ten minutes. Then splash cold water unto the body briefly to close the pores. There’s also a message and therapy room which only costs Pho250. Too bad, the masseur was not there. 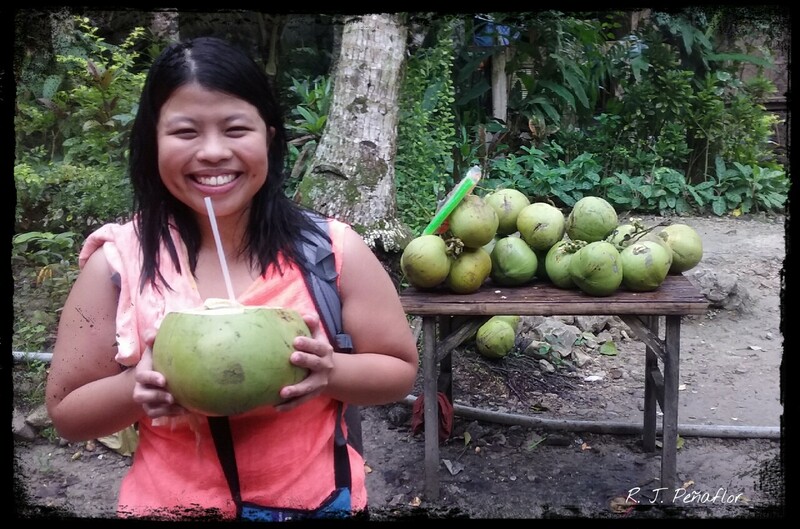 We wrapped up our visit with a refreshing sip of buko juice (coconut juice) and hot pancakes. I can’t help but stare at the sea as our tour guides, who were also the motorbike riders who chaperoned us to the site, took us back to the bus station. Everything around me was a dream that could only come once in a while. I savored every moment and every sensation that surrounded the great, blue sea that lined the highway because within its waves were good memories of a paradise I knew I’d return to one day. The roar of the sea waves was like a bewitching song entertaining us as we dined on crunchy danggit (salted, dried fish), fried rice and fried eggs. 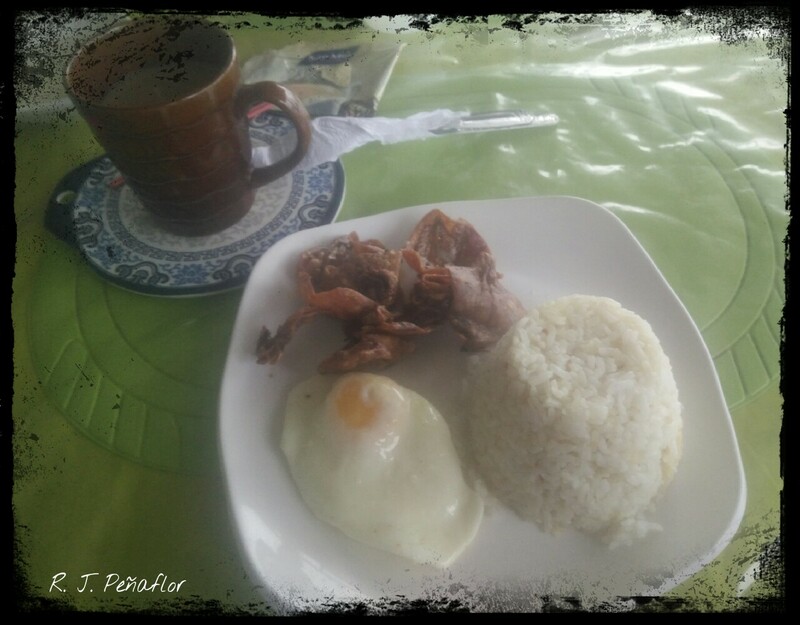 It was our breakfast on our first day, rather night, at Oslob. We had arrived at the southern tip of Cebu after a long ride from the city, a trek from the mountain and a wandering search for our guest house while riding a tricycle. Locals seem wary of foreign visitors who curiously poke their noses into their laid-back, rural lifestyle while children were the first to jump in to guide oblivious tourists like us. Just like any other barrio (little town), eateries would close as early as 8pm expect for Paul and Madz which served a satisfactory meal paired with orange juice and hot chocolate. 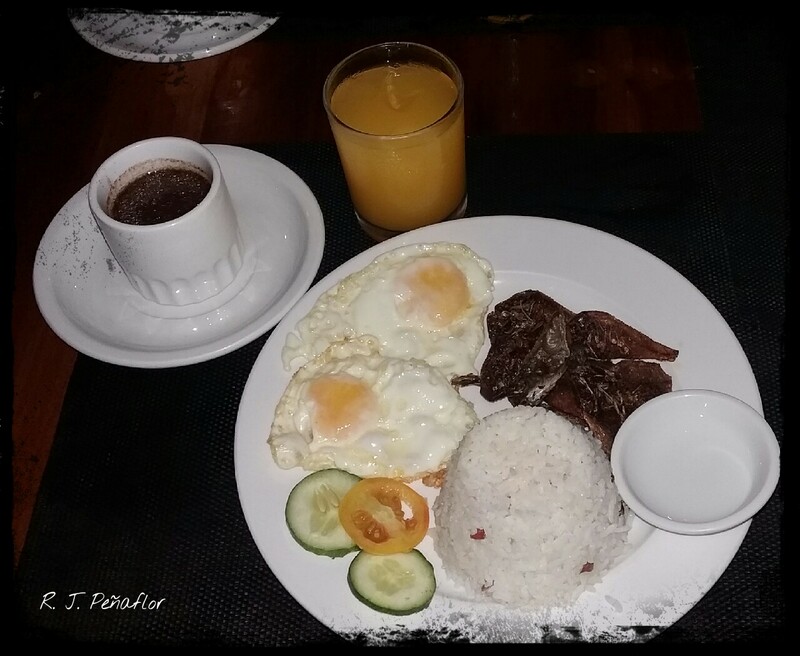 A meal of danggit with friend eggs and rice, paired with hot chocolate and orange juice. 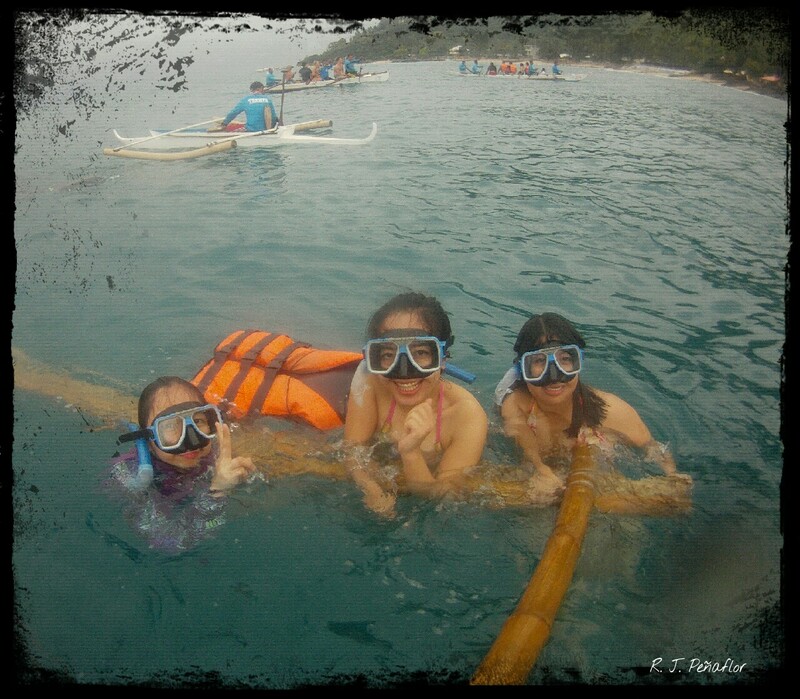 The roaring sea waves made me more thrilled to see whale sharks or the butanding the next day. These gentle giants have made Oslob a popular tourist destination as tourists are allowed to see them up close and personal (but no touching is allowed). I love animals and the butanding itself is a fascination to me. However, the weather, gloomy as ever, was threatening to cut operations early. The caretaker of our guesthouse has told us the Coast Guard has called off the whale watching operations by 9am that day due to dangerously strong currents. Supposedly, operations end by 12nn. We were hopeful, still. After a strong downpour during the early hours of the morning, we headed to the whale watching station before operations start at 6am. Foreign tourists outnumber local tourists in jam-packed queues which was beginning to grow longer because cashier windows were not opening yet. An operator told us the Coast Guard was still checking if it’s safe to hold operations today because the winds and the waves were strong. By that time, I was already assuring myself there’s always a next time to go back to Cebu. Boats gathered at the whale watching site. It was past 6am when operations were allowed to begin. 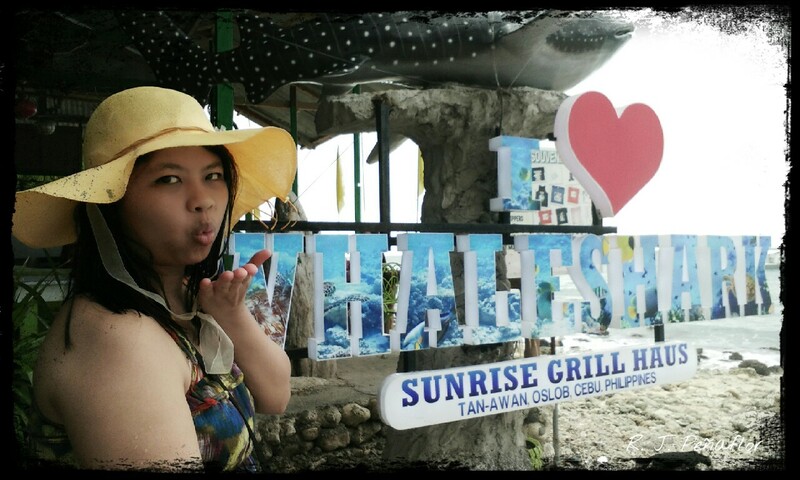 Before I’d forget, whale watching costs about Php300 while swimming with the whales is at Php500. That’s for the local rate. Foreign rates are more expensive. You can go for the first option if you’re seasick (which one of us did not realize until we were at the sea). The second option will provide you not only a close encounter with the butanding but with other sights hidden in the sea. 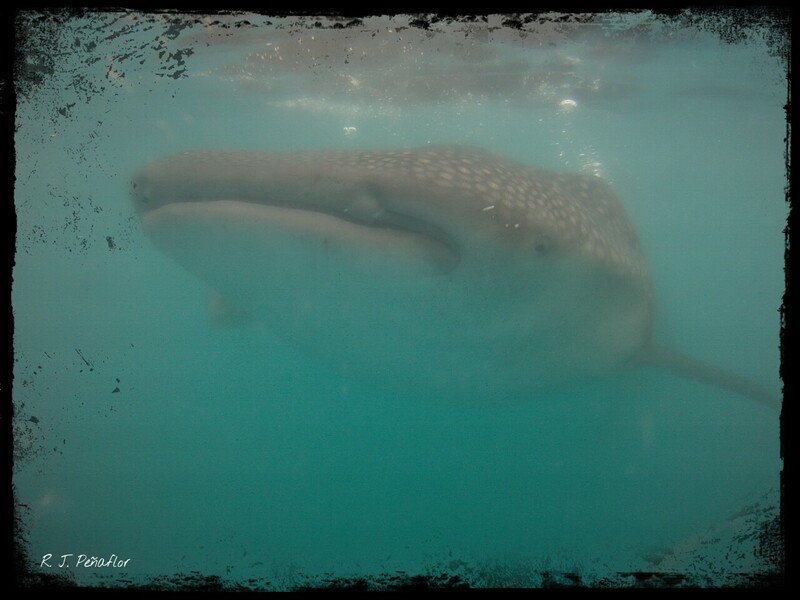 We thought we’d miss the opportunity of capturing moments with the butanding because we do not own a GoPro camera. We were able to rent one at the whale watching station at Php550. Me, along with my friends, swimming with the whales. I’m not a good swimmer, but I would love to take a dive into the sea. I admit I was scared of diving especially when the boatmen told us to remove our life vests so we can sink into the waters. Non-swimmers are advised to hold unto the rafter so we would not sink. But these guys are ready to save you before you float away into the sea. A fisherman feeding the butanding which was swimming beside his boat. 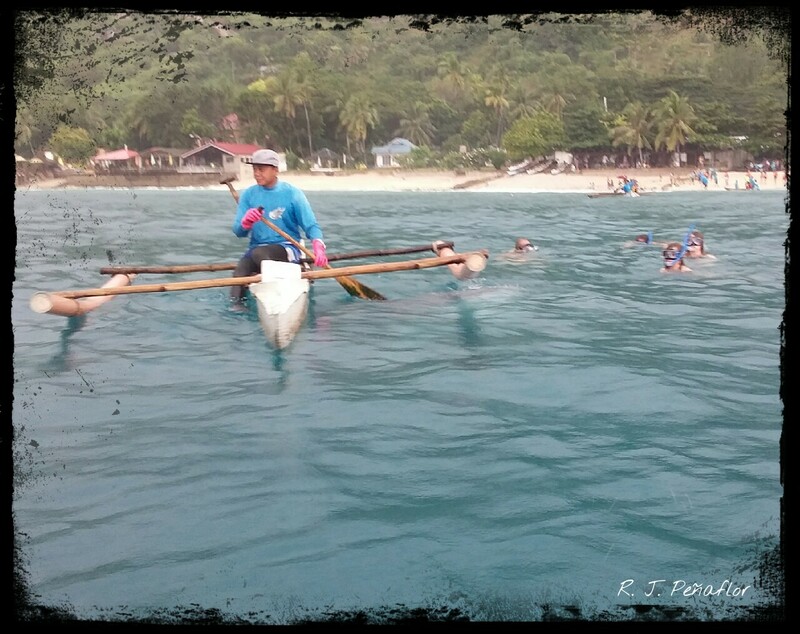 The fishermen were feeding the butanding with a breakfast of alamang (krill) when we came into the sea. I was fascinated by how its huge mouth was slurping the waters and munching its food as it moved towards us. There were about five six boats with us and some of the tourists were already taking pictures in a short distance away from the whale (because as I’ve said, touching is not allowed). I guess there were two or three butandings that were swimming among us. 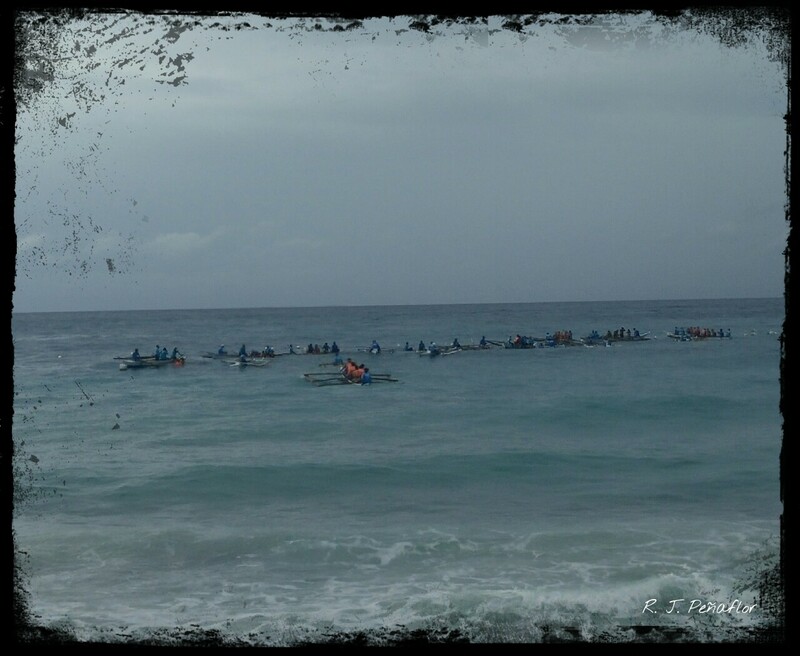 Thirty minutes were the only time allowed for each group so we had to jump into the waters to meet the whale! The butanding ignoring me as I wave behind its back. When I peeked into the sea, I was marvelled at the size of the whale which was about 5 to 6 meters long. The boatmen told us it was just a baby whale and the mother whale has not visited the area for a long time (hmmm…she might have flipped our boats by then). 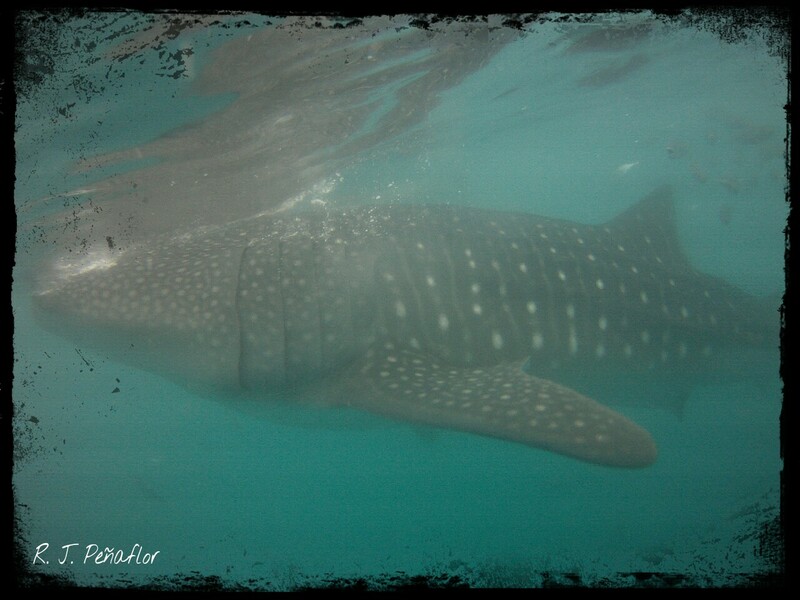 More fascinating were the fishes called alumahan (a type of mackarel) that were following the whale wherever it swims. The waters would have been clearer if the sun was shining by that time. But we were fortunate to see the whale that day despite the low pressure area that was threatening Cebu for a week. Besides, we were not burned by the heat of the sun. The wearing of sunblock or sunscreen is not allowed because these might become toxic to whales. 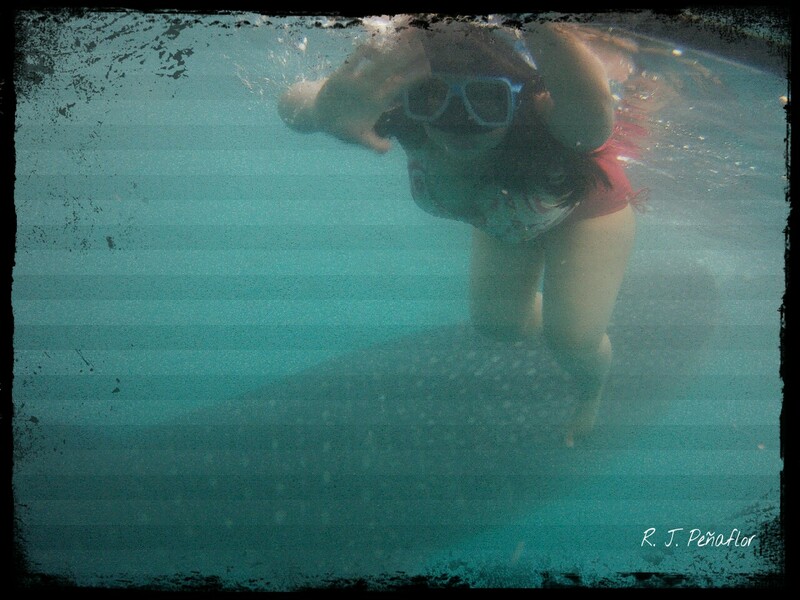 The alumahan swimming with the butanding. By the time we left the waters, the rains outpoured again. I believe the Lord has favored us by letting the rains stop for a while so we could see the whale. We were thinking of a plan B because this does not seem to be the right time to visit a nearby falls. Yours truly posing at one of the restaurants by the sea. The view of the sea at the restaurant. I was languishing myself on a breakfast of danggit and mango juice because we only had a few hours left in Oslob. 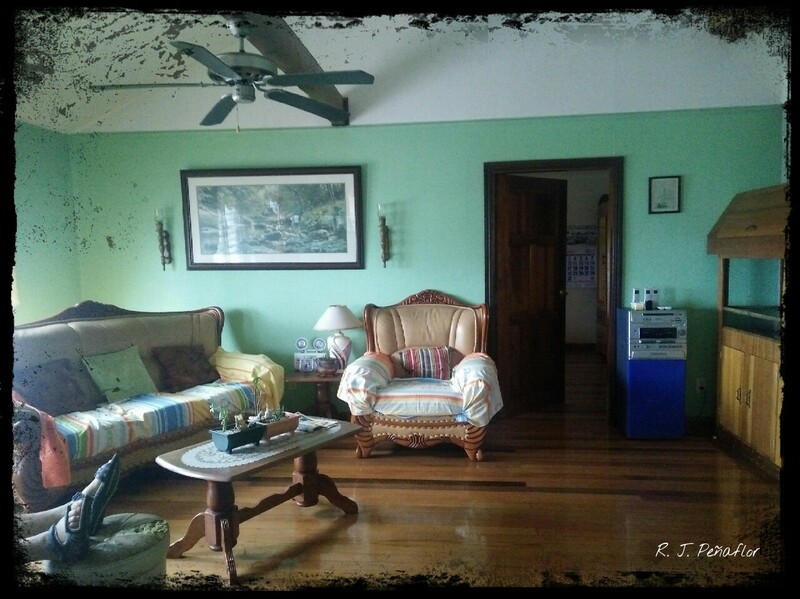 Check out time at our guest house, Chateau de Tan-awan, should be at 12nn. 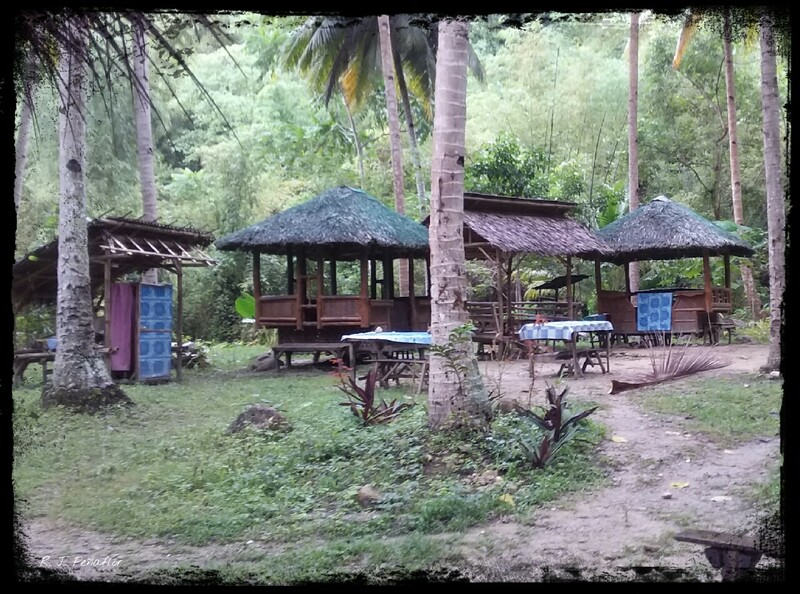 Even a night of staying in this place was memorable because it’s clean, quiet and peaceful. As it stood beside, the sound of the waves had lulled me to sleep. The lounge area at the guest house. 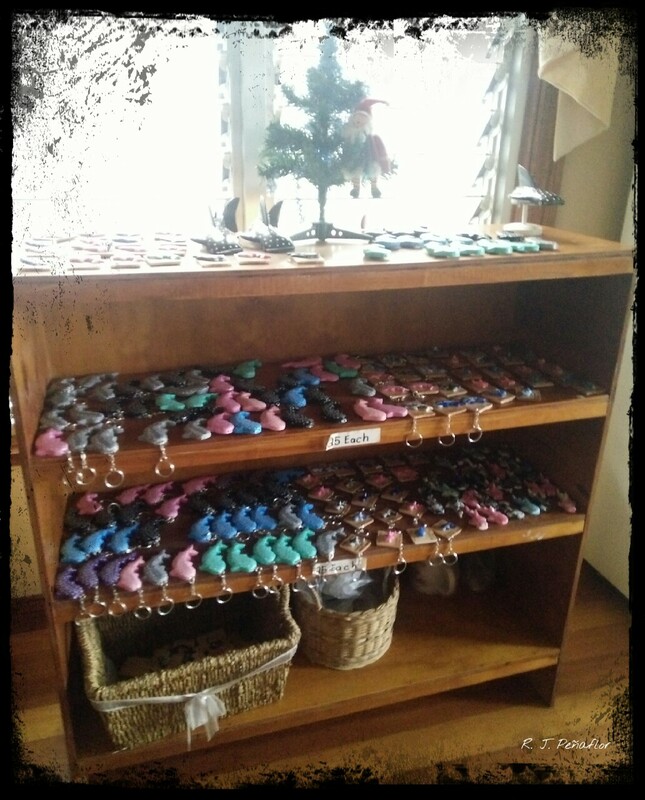 The little souvenir shop at the guest house. So we had to travel again to find another tourist spot. We barely had two days left in Cebu so we were not leaving without seeing much of the island. We got options though. We’re willing to risk for these options for the sake of collating beautiful memories. A rainy day is a real spoiler for every traveler, especially when the place being visited is a thousand miles away from home. 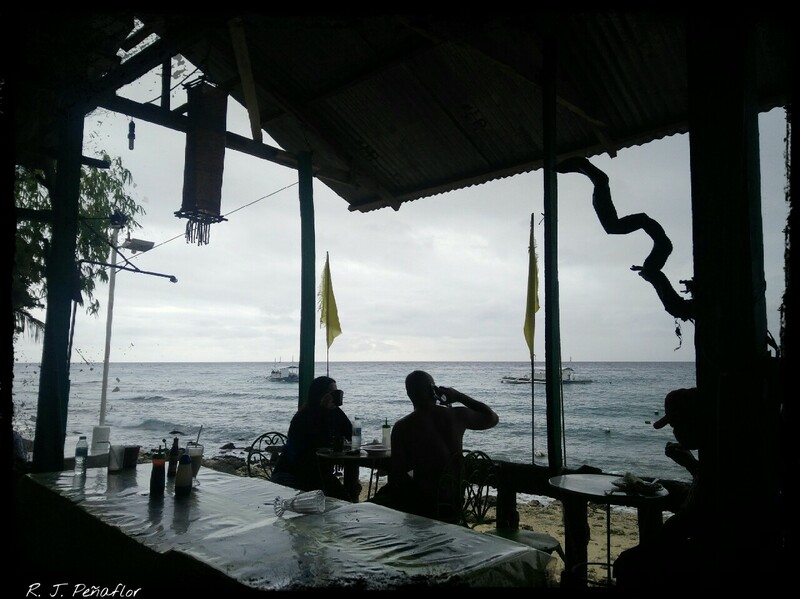 But no dark clouds can hinder us from exploring Cebu, so we headed south on our third day on he island. Being mountain lovers, we decided to trek the heights of Osmeña Peak. 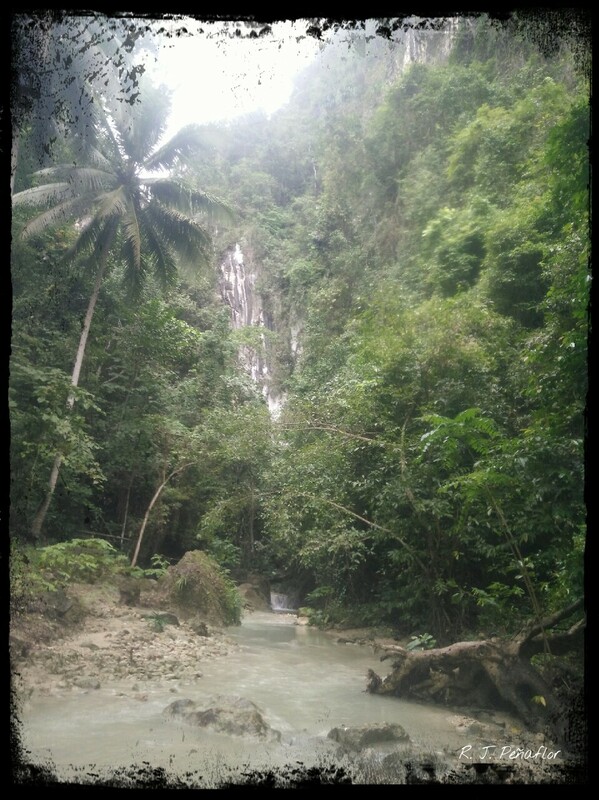 We had to travel about three hours from the city of Cebu to get there. By that time, I realized that the island was too big to explore and I am just too small to be overwhelmed. Drizzles were dampening the atmosphere at South Terminal where we boarded the bus going to Oslob (which I will feature on my next blog) We made sure the bus would pass by Dalaguete as there are two different routes going to the far south end of Cebu. 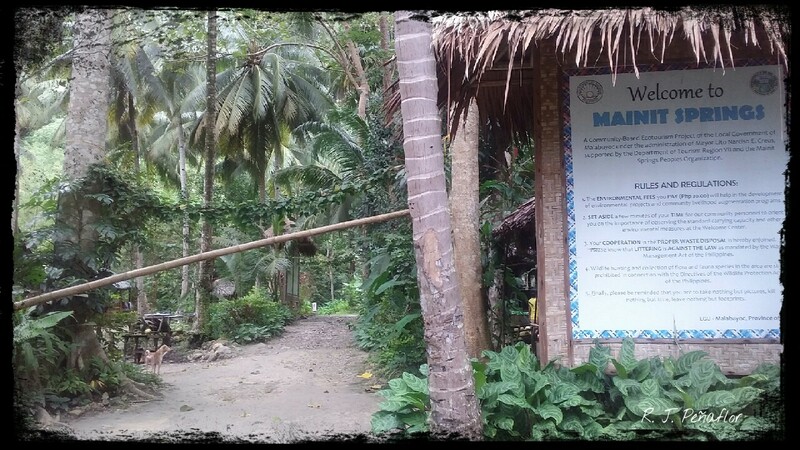 The real adventure begins when the bus dropped us off at the town of Badian. Every tourist who don’t have their own vehicles would have to take a motorcycle ride to the jump-off point. It took about an hour of travelling through smooth, meandering roads and inclined trails. A backride costs about P200. The most amazing thing was that the motorcycle was able to carry all the three of us! 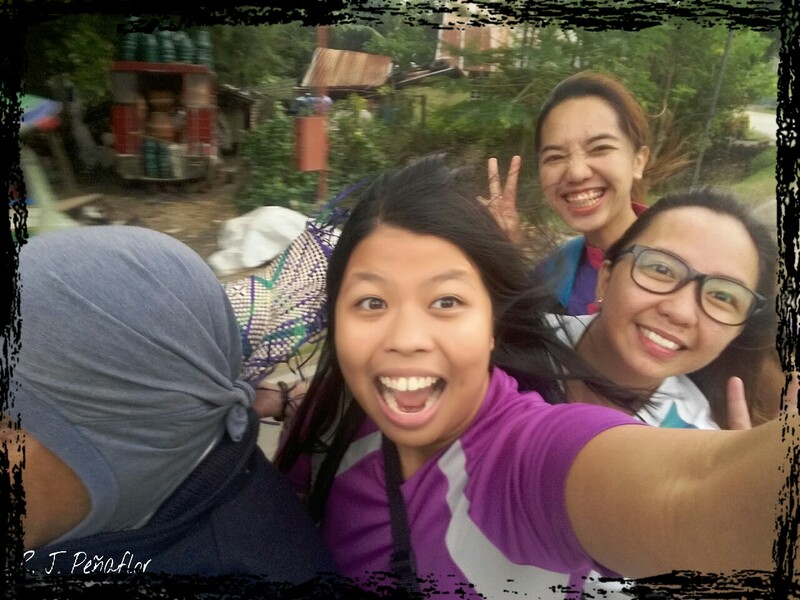 (From far right) Lans, Ros, and Rhema (yours truly) going crazy on the motorbike ride. The weather was becoming more dreary as we went deeper into more isolated roads. 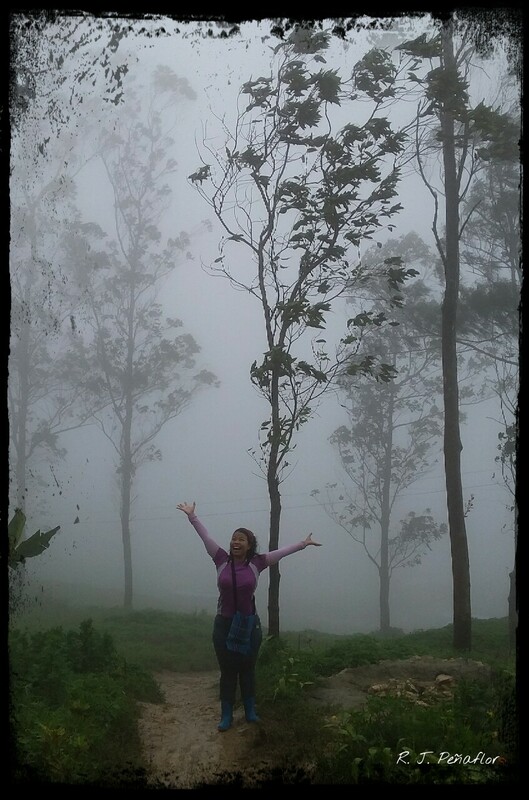 Fog began to enshroud us halfway going to the jump-off point, making me think I am entering Wonderland. What surprised me even more was when pine trees towered above us along the way, shattering my impression that Cebu was a fully tropical island crowded with sunny beaches and coconut trees. 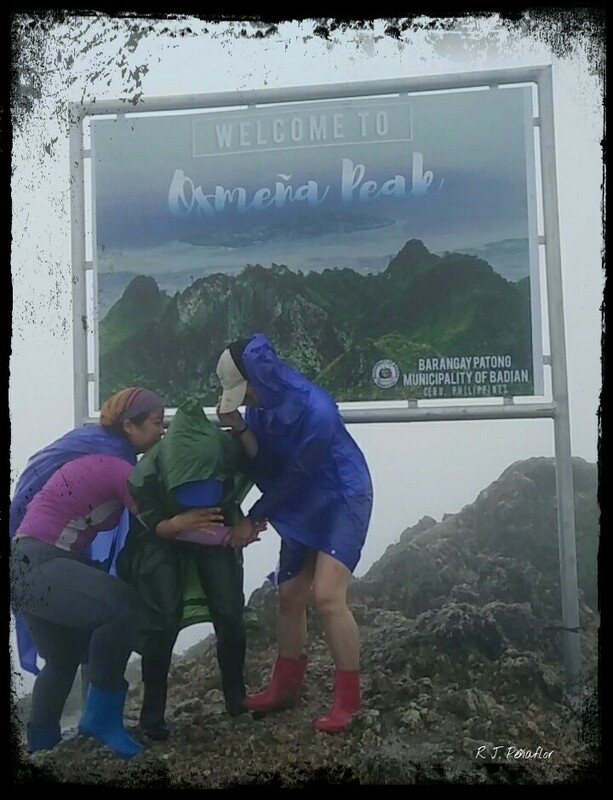 Osmeña Peak has a height of more than 1000 masl but the trek would only take about 20 to 30 minutes from jump-off point. We were greeted with young men offering us boots and raincoats which cost about Php50 each. We felt obliged to rent them because the ice-cold rain has been continuously making the trail soggy and muddy for almost a week. But the sunny smile of our tour guide, Evangeline or Evan as she would like to be called, made me enjoy the trek because of her stories. 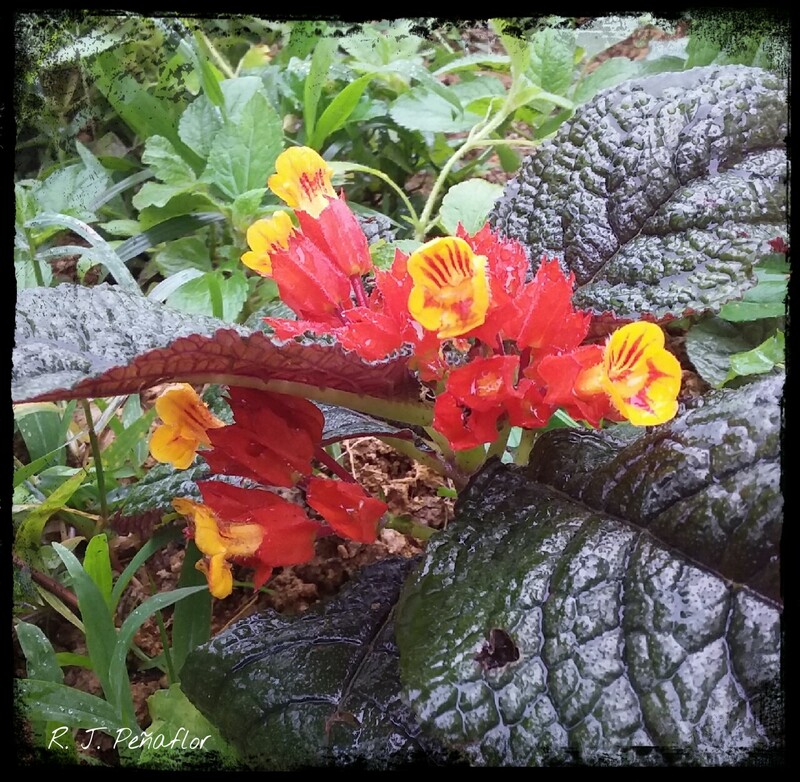 Some of the flowers that can be seen on the mountain. Evan said the original jump-off point of Osmeña Peak was at the municipal town hall of Badian which was two hours going to the peak if taken by foot. With the development of roads, tourists have now an easier access to the heights. Still, the town maintained its agriculture industry. Called the Little Baguio of Cebu, Osmeña Peak floirishes with lush vegetation. 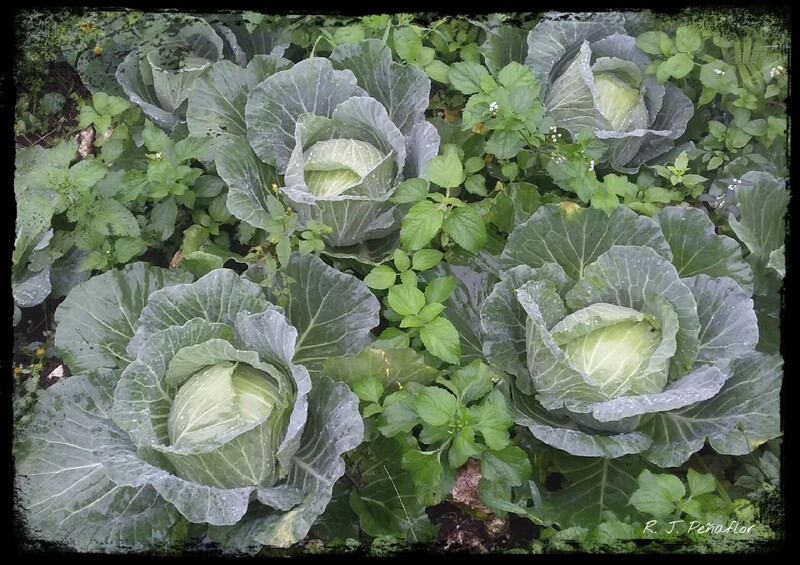 The place reminded me of Benguet as huge round cabbages flourished on the mountain side. Evan told me locals in this town have a very simple lifestyle. Most houses could not be brightened up by electricity at night and residents use fire and wood to cook their food. 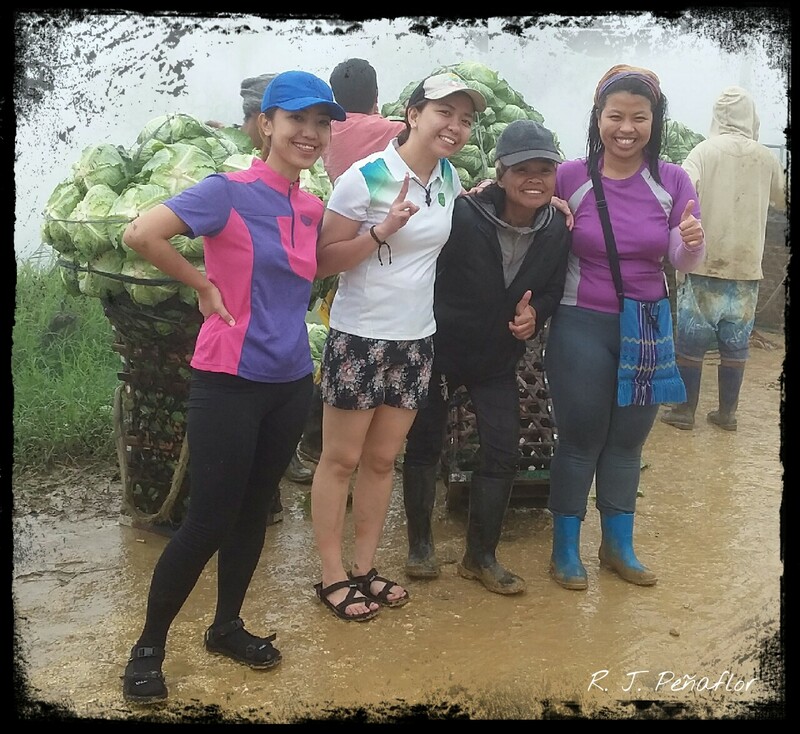 Just like the farmers of Benguet, they would carry their harvested vegetables to the lowlands and trade them for fish. Evan had this vibrant spirit and singsong chuckle as she showed me plants that would only flower at night and other strange plants that could only be seen at the site. And just as always, I was the only person Evan guided along the way because of my tendency to lose balance. 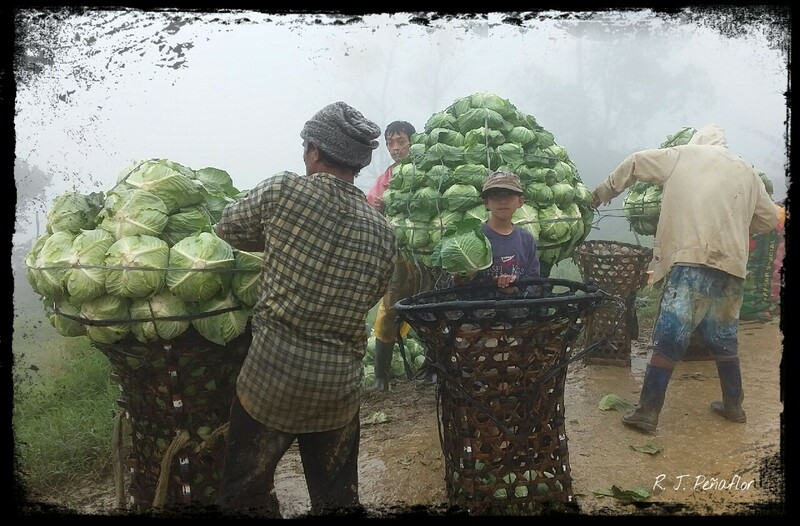 The cabbages being loaded on trucks, ready for trade. The winds became stronger as we trudged near the peak. Unlike what we saw on the internet, we saw no green hills but only a white blank space on the horizon. The signage harrumphed noisily as the wind slammed violently on it. 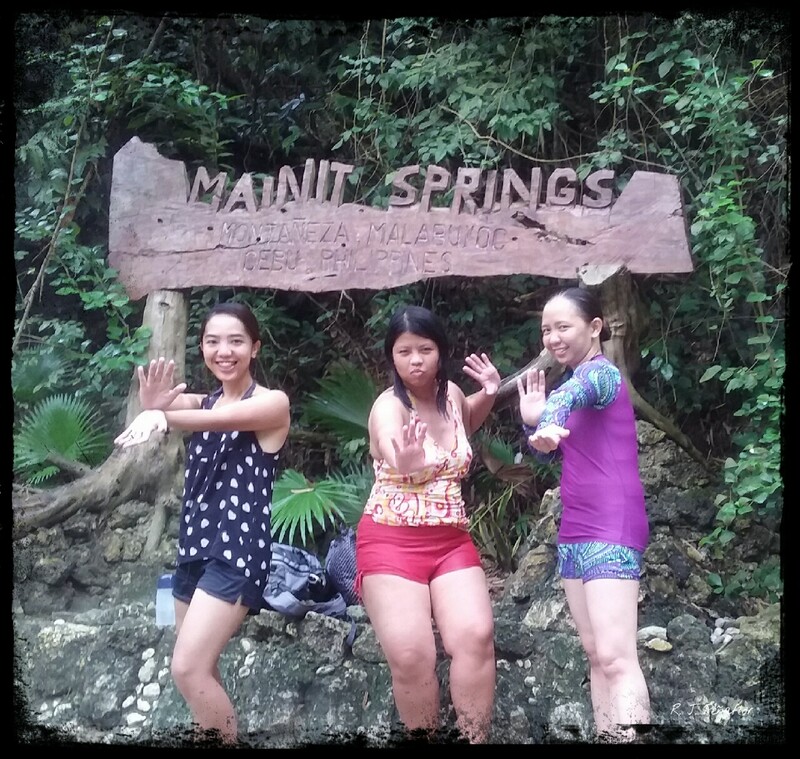 We screamed as we posed before my already wet camera. Evan maintained her pose and her eternal smile as she calmly took a picture of our panicky faces. Seeing nothing on the mountain did not fully disappoint me because of the discoveries I made along this short trip. Besides, the vibrant spirit of the locals was enough to energize us. It did not turn out the way we wanted it, but just as they always say there’s always a next time. Should I return, I’d return there by April as the locals have advised. And I hope Evan would guide us again – this time along dry land and beneath clear skies. Our groups takes a pose with Evan (in black jacket) after the trip. 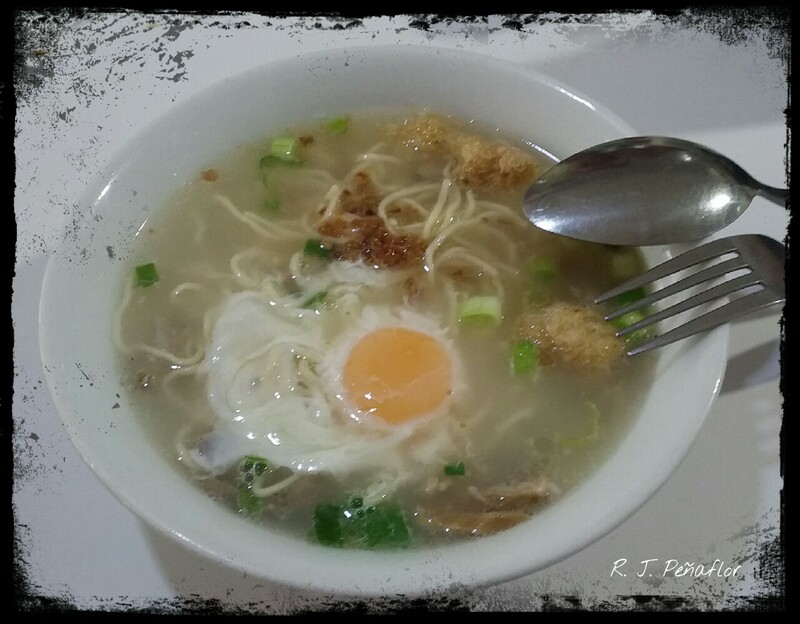 We ended our cold trip with a bowl of batchoy (warm pork noodle soup) and a day full of laughs. Boarding on the bus going to Oslob, I kept my eyes on the blue-green sea that lined along the highway. Tomorrow shall be another day of adventure. And this is the one I was looking forward the most. I was exhilarated and nervous at the same time. I gulped my coffee before I boarded on the plane. I felt my first panic check-in attack after a two-year flying hiatus. I had great trouble fixing my luggage one day before take-off. But I was still numb from the fact I was about to head to the far-away island of Cebu. 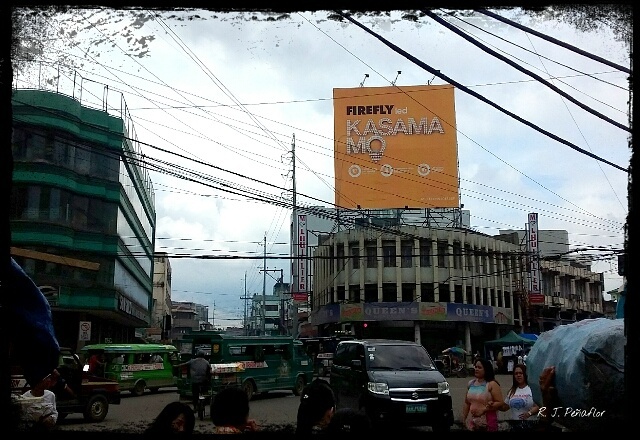 I thought I was transported back to Recto, Manila when we dropped by Colon in Cebu City. One of the curious little facts of this city. Cebu is one of the major islands situated in the Visayas region. Travelling there by plane from Manila would take about one and a half hours. Called the Queen of the South, Cebu is the region’s main economic center. 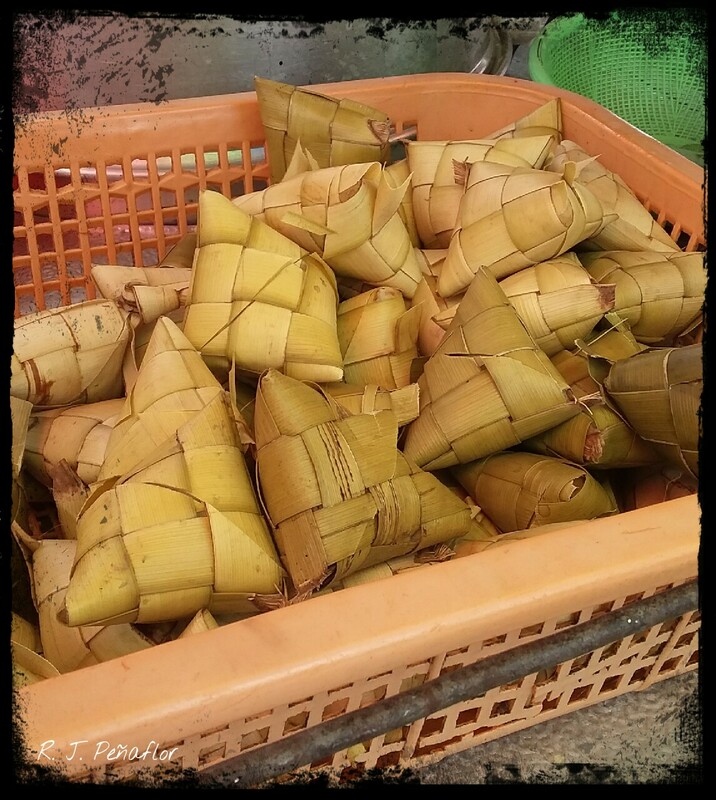 It is known for its beaches, dried mangoes, native guitars, otap (flaky biscuit covered in sugar), lechon (roast pig), and its yearly festival called Sinulog (an event dedicated to the island’s major saint). I honestly am not interested in religious festivals. 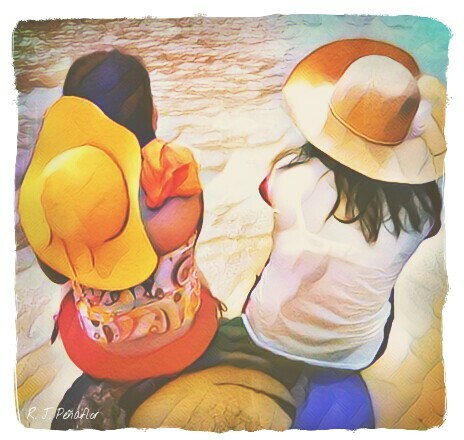 I wanted to tag along with my friends because I wanted to experience the magic this island has to offer. 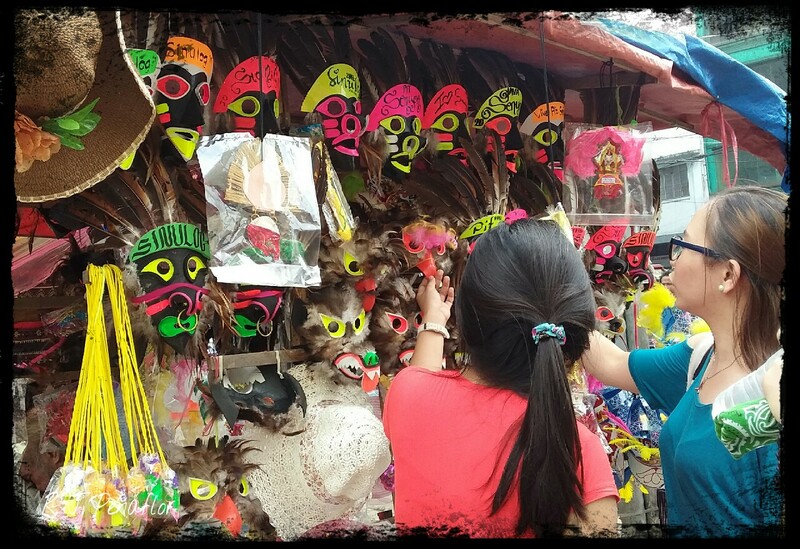 Masks being sold at Sinulog Festival. 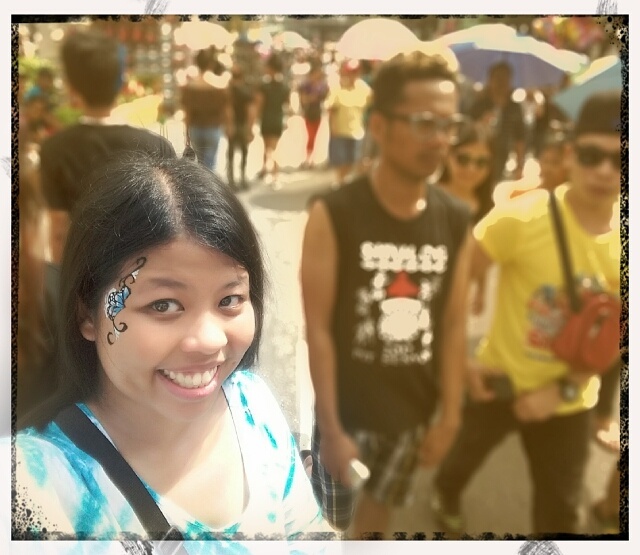 Curious as a cat, we strolled around the city despite missing the Sinulog parade. Like little kids, we had face paint, bought hats, and looked at what the crowd was looking at. I was surprised when Cebu City appeared to be a prototype of Metro Manila. Colon itself was reminiscent of Recto, scenes around the Church of Sto. 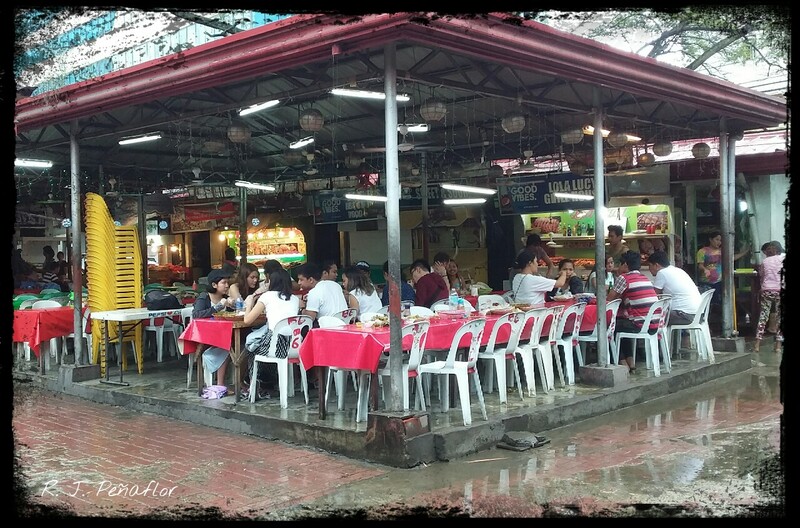 Niño was almost identical to that of Quiapo, and the markets looked like Divisoria. I felt like I have been transported back to Manila so we tried to see other spots where we could stroll along. 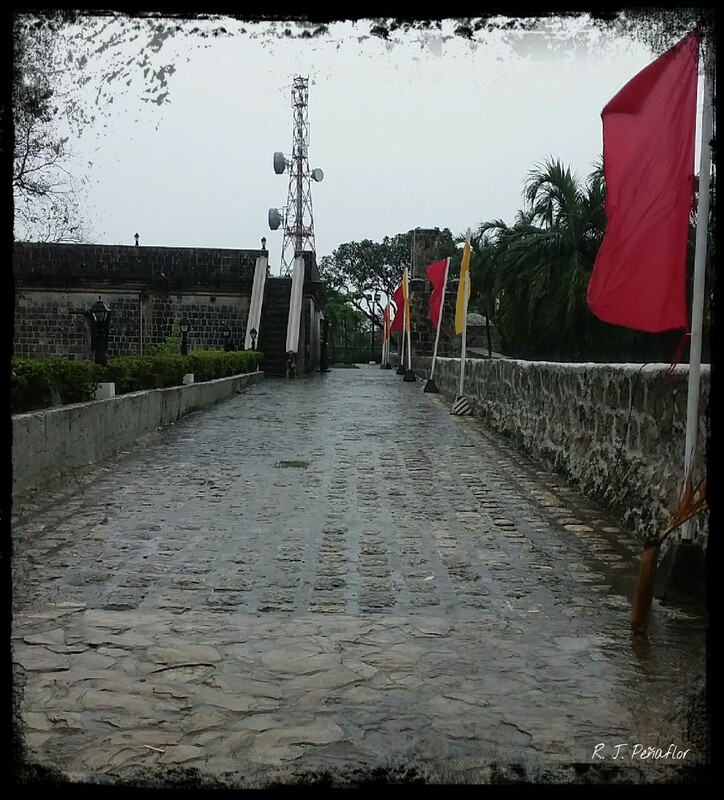 Rains had spoiled our second day so we ended up in Plaza Independencia and Fort San Pedro. The latter looked like a mini-version of Manila’s Fort Santiago in Intramuros. The reason it is so is because Cebu was one the Spanish conquistadores’ main headquarters before they moved to Manila where they built a similar fortress as Fort San Pedro. 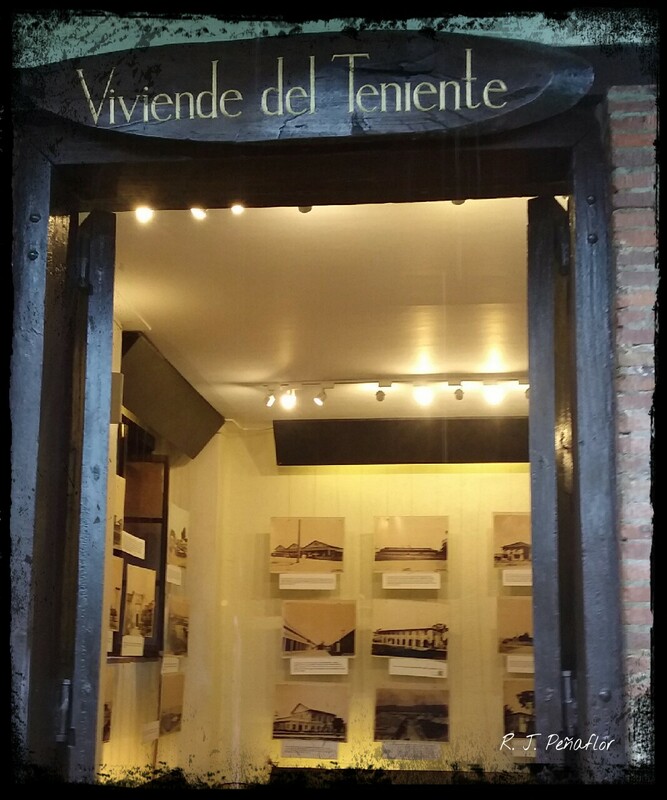 Entrance is only at Php30 and it is here where you will get a glimpse of Cebu’s history. For those who have studied at schools around Manila’s Intramuros, you might mistaken this as a lane at Intramuros but it’s actually in Cebu’s Fort San Pedro. 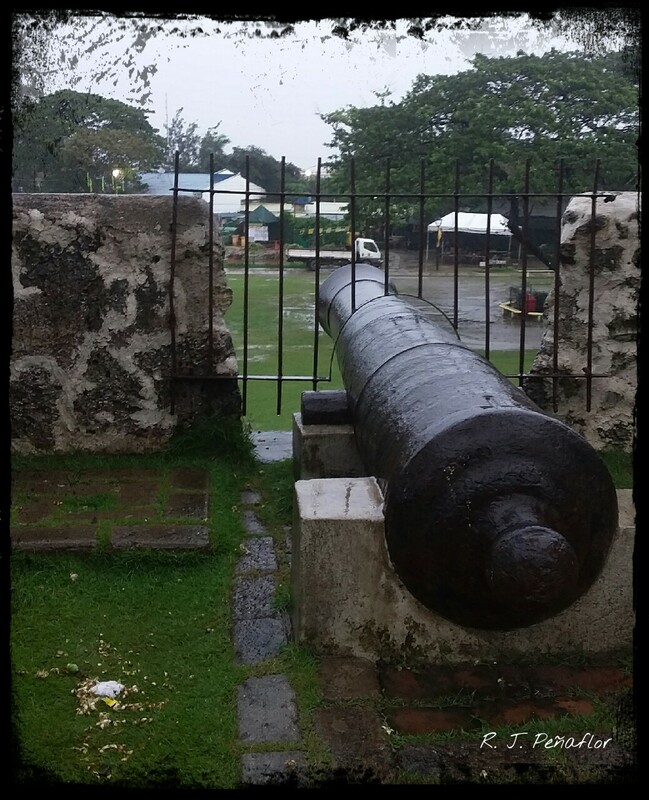 A canon overlooking Plaza Independencia. One of the similar sights in Manila’s Intramuros. 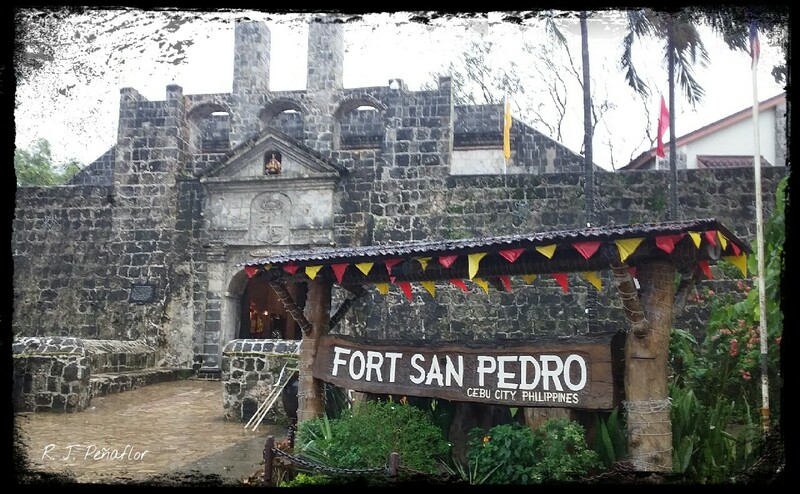 One of the galleries that could be found in Fort San Pedro. This one is filled with pictures from this site’s history. 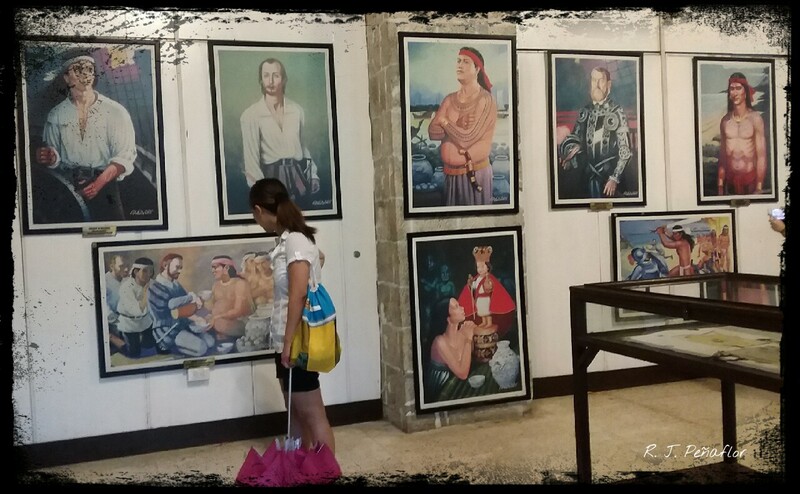 Another gallery featuring portraits of some of Cebu’s founding fathers and historical figures like Ferdinand Magellan and Lapu-Lapu. 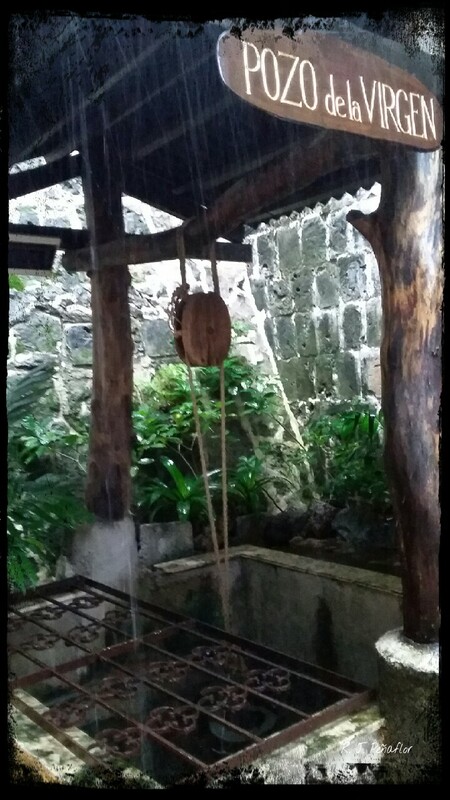 Toss a coin to make a wish at this wishing well at Fort San Pedro. The best part of our initial stroll was the food trip. 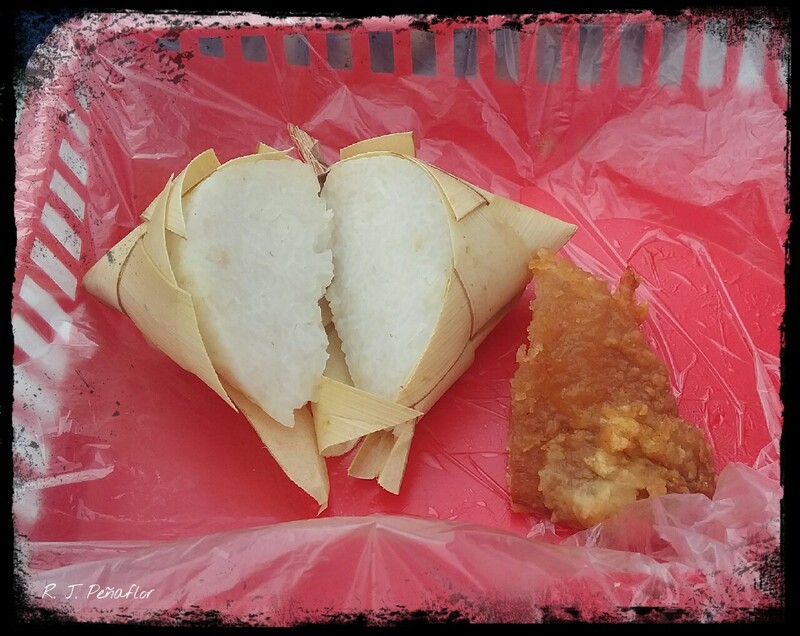 From street food to mall diners, every meat comes with a serving of pusô (not the heart, but it is rice wrapped in leaves). 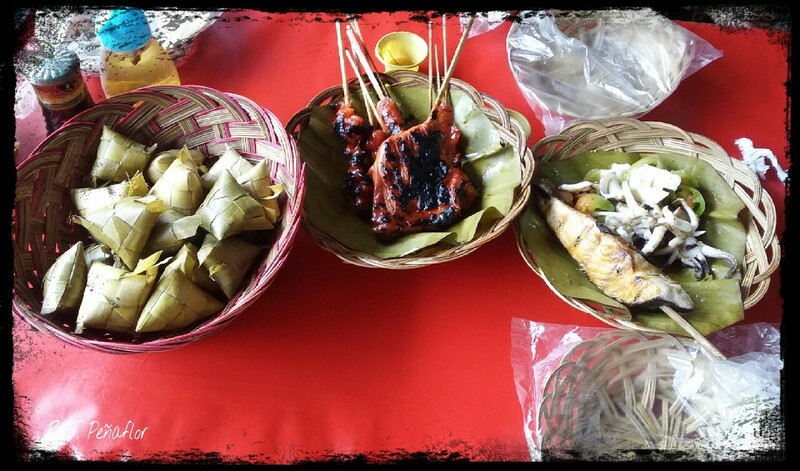 Ranging from Php3 to Php5, they are being served on baskets along with a viand of siomai, pig’s face (yes! 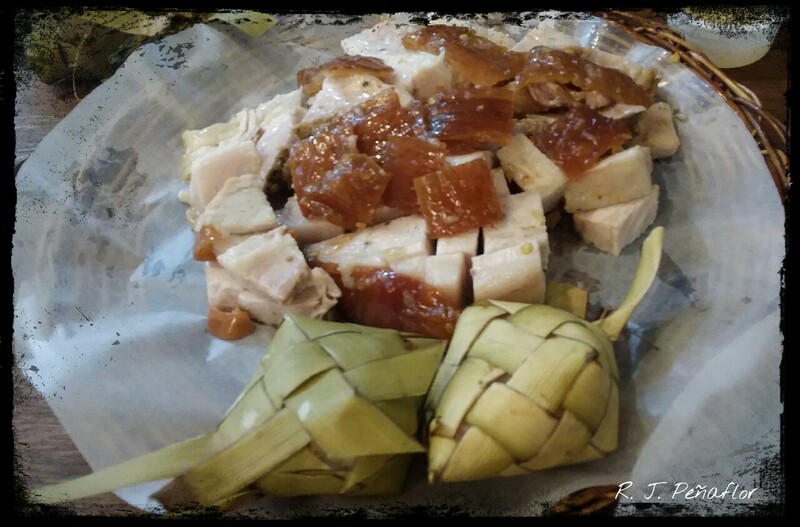 The skin made to be thin and crunchy before your eyes), or spicy lechon (somebody help my diet!!). 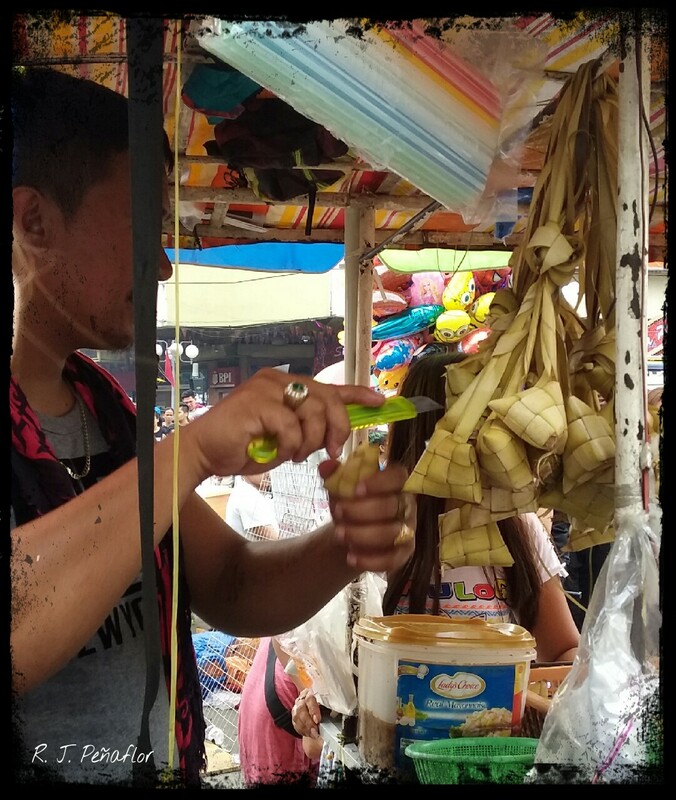 A vendor slashing the pusô in the middle. 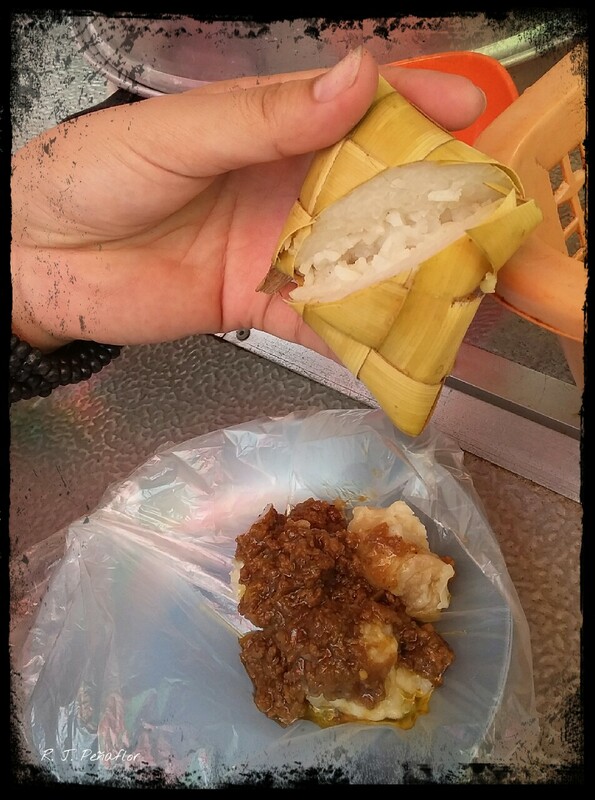 Street food siomai with pusô. to eat your food by hand. Don’t worry, they will give you clean hand gloves. Pusô with, not pork chop, but with pig’s face. Larsian is a recommended eatery in the city, especially for all grilled food lovers. They have a variety of meats, chorizos and seafood such as squid and blue marlin which they will grill and serve at your table. Each of them range from Php20 to Php150. And of course they come with pusô. As I’ve mentioned, Cebu is good for their otap so we did not miss dropping by Shamrock which was located along the Rotonda near Larsian. 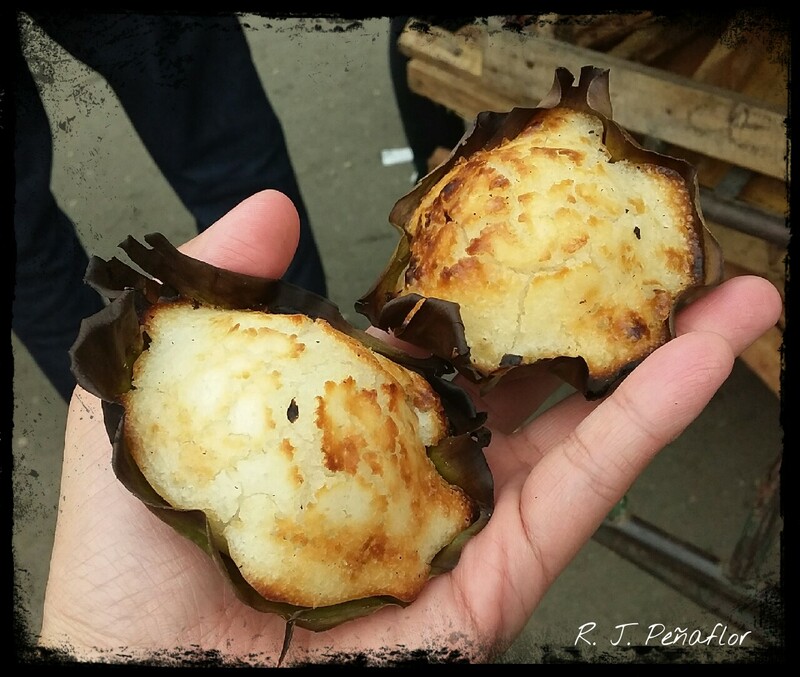 It also has a variety of other goodies like my childhood favorites, ronquillos and torones de mani. 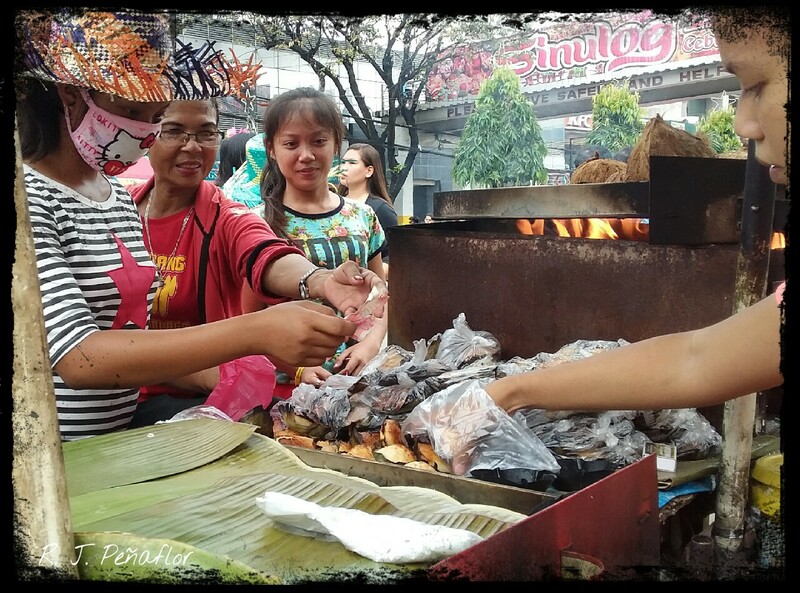 Other street food treats to be found in Cebu. This lady is selling baked rice cakes cooked in an oven. 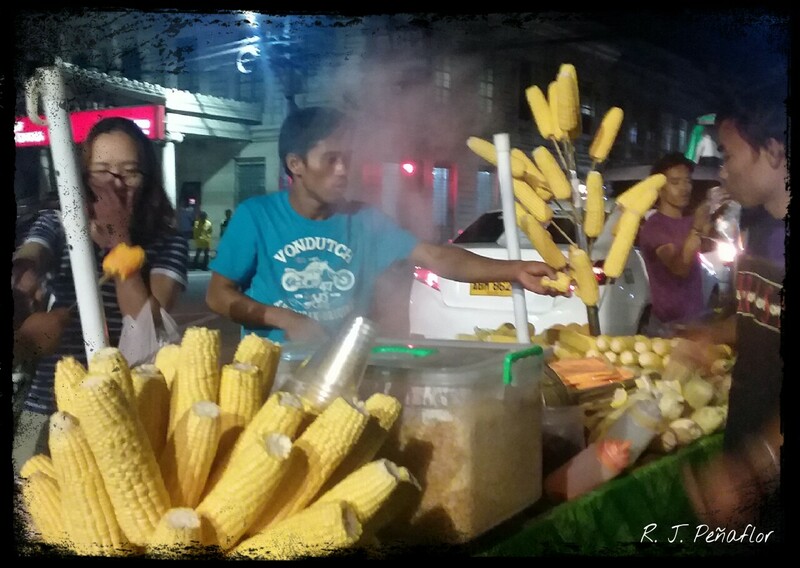 Corn on a cob sold on the street. I guess buying pasalubong and souvenirs was the greatest irony on the initial part of our trip. But that does not signal the end of our Cebu trip because we still have more to visit for the next three days. I was on a mission to sort out my list of friends on my Facebook account to remove clutter: the non-existing account, the one-time friends and the total stranger. I was surprised to find over a thousand names linked to my account. Most of them were colleagues, former colleagues, relatives and former classmates (including that crush and that bully). Truth is, I could only count my closest friends with my fingers. But I was hesitant to remove most of those in my list because I’ve had acquaintances with them in the past. When Facebook was first introduced, I hoarded tons and tons of “friends”. Social media became a platform to connect and reconnect. But it also became a tool to make us feel “closer” to our secret crushes (too bad if your crush only posts once a year). Because the longing to make friends is an inborn quality in young millennials, we easily add to Facebook anyone – just anyone – we meet for the first time. That kind of friendship, I realized, is platonic because they vanish overtime. Even without meeting them personally, some people kept on adding to their list anyone who’s connected to a mutual friend or who belong to the same affiliation as theirs. At first, I accept their friend request out of courtesy. But I realized later that might not be helpful. But most of all, they could be assets to the gossip world, especially when they read posts such as this. “Monday. Office drag day. Only your smile can turn it into a happy day.” Forward ko ito kay boss para di sya pumasok. Haha! “I only have 100 left in my wallet. But I have a thousand more reasons to love you.” Pare, may pangmaryenda na tayo! Aabangan natin sa kanto! Ok, that sounds too exaggerated but sometimes, stalkers are really born out of social media. Having a thousand friends on social media does not mean you are the universe’s Ms. or Mr. Congeniality. Sometimes, they are just there to taunt you (because of a bitter feud you’ve had with that person), to make business with you (“open-minded ka ba? Kasi ako hindi harhar!”), or to linger in your memory. As I grow older, I realize my truest friends don’t go beyond a thousand…even a hundred. A few of them don’t even have Facebook accounts. The rest can only like and comment with flattering words but those who really matter are willing to go out of the social media world to see you face-to-face. Social media has created a universe that is different from the real world we belong. It gives us the capacity to become perfect in everybody’s eyes by acting like a star on this virtual universe. But only real friends know you for who you are. They follow you not because you’re an internet sensation but because they love you are you are. That’s why I need to clear up clutter because I only like to keep those who matter to me. Besides, Facebook was originally meant to connect with friends, so why not just keep the real friends that you have?